The gastric sleeve (or sleeve gastrectomy) surpassed the gastric bypass as the most performed weight loss surgery in America in 2013, with 42% of all procedures done nationally being gastric sleeve.1 This is due in large part to the sleeve gastrectomy’s impressive weight loss results with minimal complication rate. 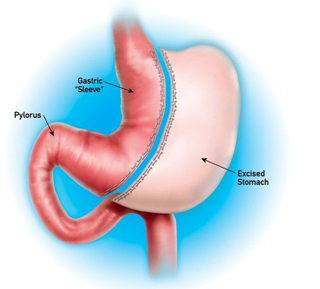 The gastric sleeve was originally performed as the first half of a more complex procedure for patients who were considered too high risk for other procedures, such as gastric bypass. The patients experienced such good weight loss results that many ended up not needing the other half of the surgery, and the gastric sleeve was born. Patients who choose gastric sleeve surgery on average lose between 60 percent and 77 percent of their excess body weight as early as 12 months after surgery2. As with all weight loss, results vary based on several factors, including compliance to post-operative behavioral guidelines. During the gastric sleeve procedure, the surgeon will narrow the stomach — normally about the size of a football — into a thin vertical sleeve about the size and shape of a banana. The remainder of the stomach is then removed. You’re left with a smaller stomach that will help you feel fuller on much smaller portions of food, while allowing for normal digestion and absorption of nutrients. The sleeve also has been shown to result in the secretion of fewer hunger hormones, resulting in less overall hunger. Not sure which bariatric procedure is right for you? Visit our Choosing a Procedure page for a side-by-side rundown of gastric band, gastric sleeve and gastric bypass. Allow yourself time to adjust to your new lifestyle. You’ll need time to figure out how your new routine of healthy food and exercise fits into your life. No heavy lifting (more than 15 pounds) is allowed for four to six weeks post-surgery. You will be physically able to return to work between one week and two weeks after surgery, depending on the type of work you do. You will have the support of our dedicated team of medical professionals who will work with you on nutrition, exercise, psychological and physical therapy needs both before surgery and for the long-term. However, as with any surgery, there are risks. When deciding whether gastric sleeve surgery is right for you, the perceived benefits must outweigh the potential risks. To learn more about specific complications associated with gastric sleeve, visit our Risks page. During a gastric sleeve procedure, New Jersey Bariatric Center® surgeons will remove a section of your stomach, reducing your stomach size to a narrow sleeve. Patients hold less food and feel fuller faster.